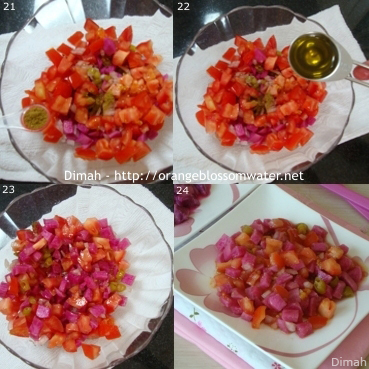 1- Salatet Mkhallal Al-Shawandar (Salad prepared with Pickled Beets). 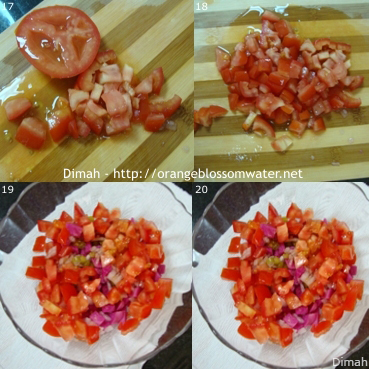 2- Salatet Mkhallal Al-Left (Salad prepared with Pickled Tunrips). I learned it from a chef from Aleppo, and they call it “Salatet Set Kalileh”. 1. 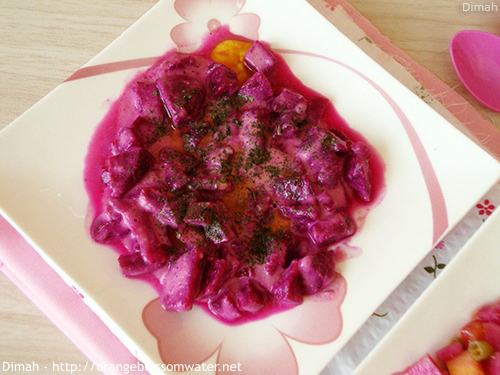 Bring Mkhallal Al-Shawandar (Pickled Beets). 2, 3, 4. Cut into small cubes. 5, 6. Transfer into a bowl, and set aside. 7, 8. 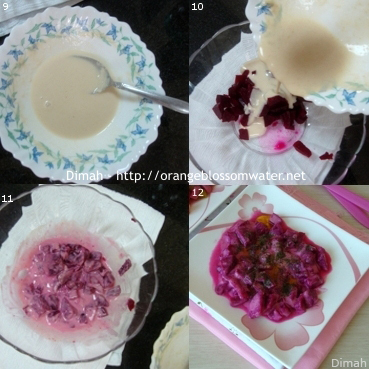 In another bowl, mix tahini, lemon juice and water. 9, 10. 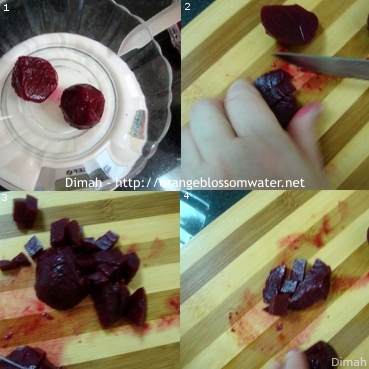 Add tahini sauce to pickled beets cubes. 11. Toss, taste and add salt if needed. 12. Transfer into serving plate, and sprinkle with dash of dried mint. I usually keep the salad in the fridge for an hour before serving, this will bring up the flavors. 1. 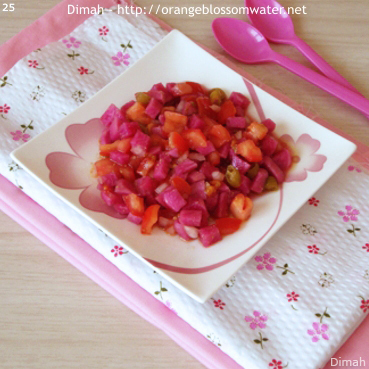 Bring Mkhallal Al-Left (Pickled Turnips). 5, 6. Transfer into a bowl. 7, 8. Bring pickled hot green pepper (same in picture), and cut into small pieces. 9, 10. Add pickled hot green pepper into pickled turnip cubes. 11, 12. Bring onion, and cut into small pieces. 13, 14. Add onion into pickled turnip cubes. 15, 16, 17, 18. 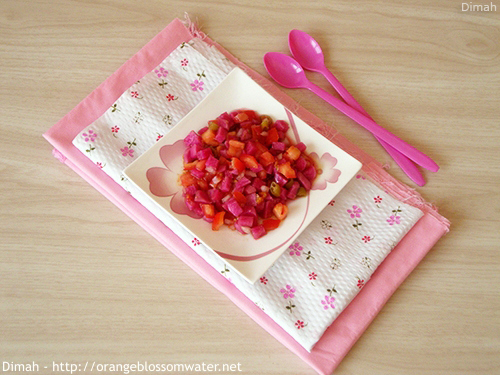 Bring tomato, and cut into small cubes. 19, 20. 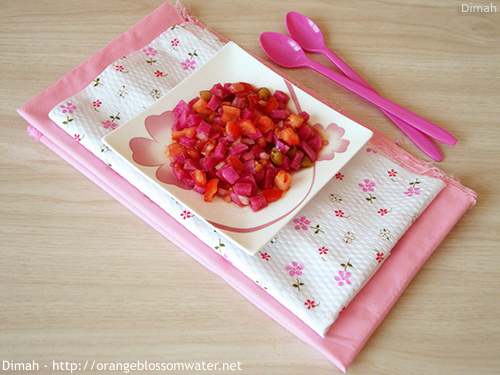 Add tomato cubes into the mixture of pickled turnip, pickled hot green pepper and onion. 21, 22. Season with cumin, and olive oil. 23. Toss together, taste and add salt if needed. 24. 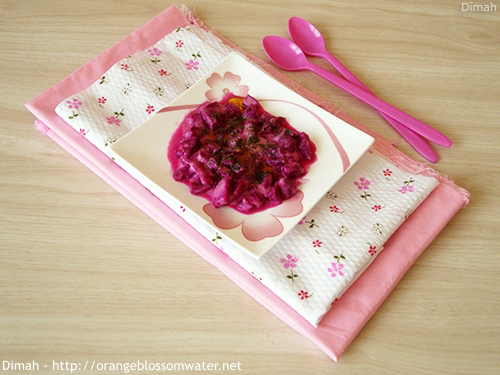 Transfer into a serving plate. I uausally keep the salad in the fridge for an hour or two before serving, this will bring up the flavors. 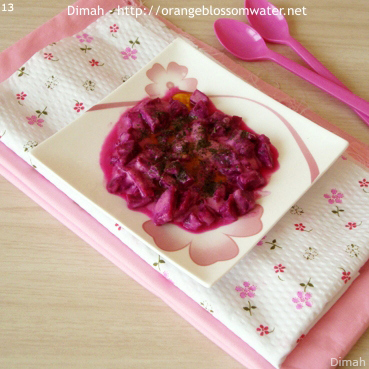 Dash of dried mint Bring Mkhallal Al-Shawandar (Pickled Beets). Transfer into a bowl, and set aside. 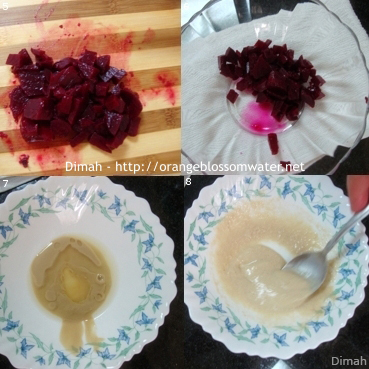 In another bowl, mix tahini, lemon juice and water. 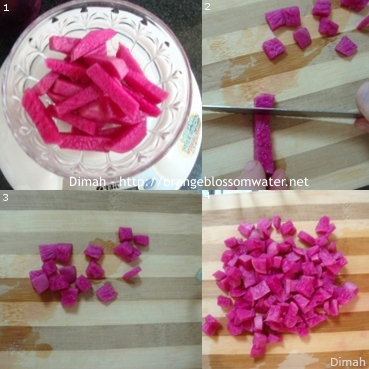 Add tahini sauce to pickled beets cubes. Toss, taste and add salt if needed. Transfer into serving plate, and sprinkle with dash of dried mint. I usually keep the salad in the fridge for an hour before serving, this will bring up the flavors. 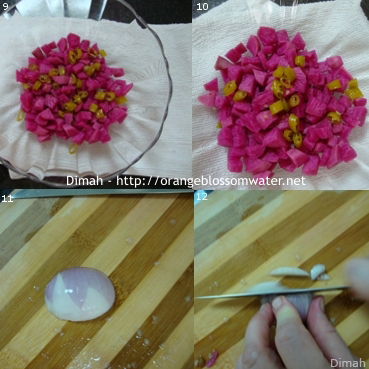 Bring Mkhallal Al-Left (Pickled Turnips). 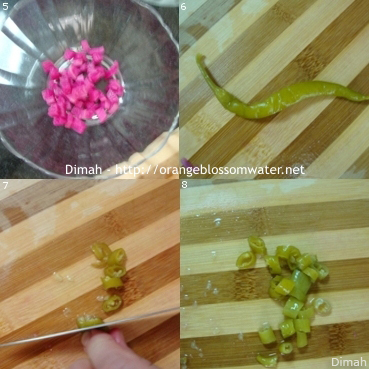 Bring pickled hot green pepper (same in picture), and cut into small pieces. Add pickled hot green pepper into pickled turnip cubes. Bring onion, and cut into small pieces. 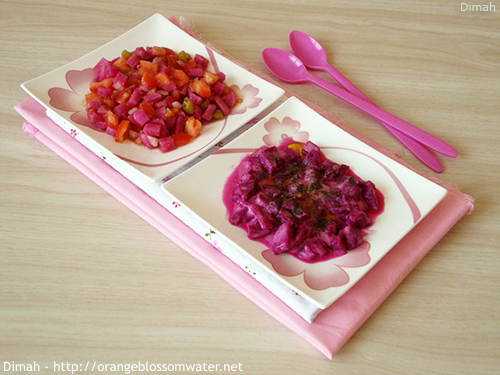 Add onion into pickled turnip cubes. 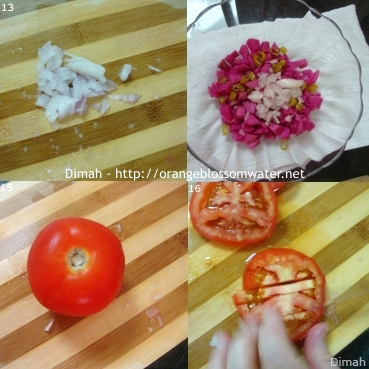 Bring tomato, and cut into small cubes. 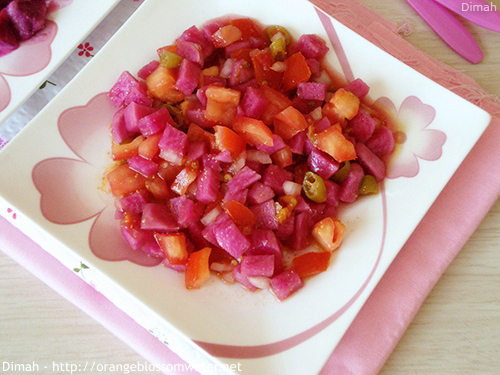 Add tomato cubes into the mixture of pickled turnip, pickled hot green pepper and onion. Season with cumin, and olive oil. Toss together, taste and add salt if needed. Transfer into a serving plate. I usually keep the salad in the fridge for an hour or two before serving, this will bring up the flavors. 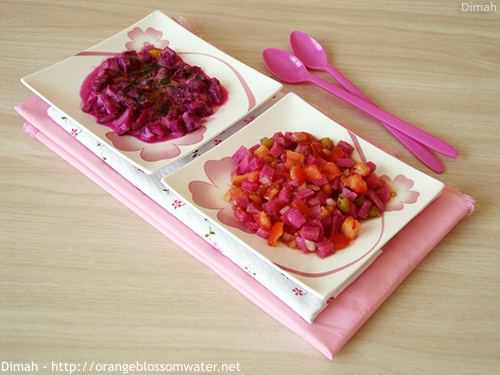 Recipe of Pickled Beets and Pickled Turnips is available in this post (Mkhallal). This entry was posted on Friday, January 31st, 2014 at 9:17 PM	and is filed under Syrian Cooking. You can follow any responses to this entry through the RSS 2.0 feed. You can skip to the end and leave a response. Pinging is currently not allowed. Both salads look yummy! I love beetroots and will try your tahini dressing soon. I am so happy to have discovered your lovely blog, I love Syrian food, especially recipes from Aleppo in that they are so unique and have such a myriad of influences. 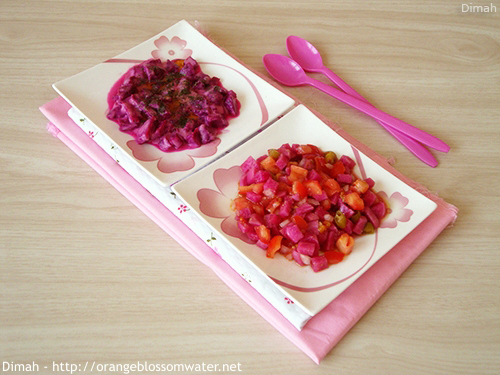 I love salads with pickled vegetables, looks nice and fresh for the Spring and Summer, I will be following your posts! 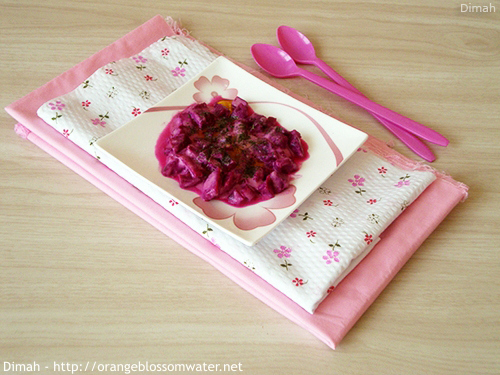 That seems so delicious and so healthy, love the color as well.. I’m sure My kids will love this also..